The Aerozone is Stansted Airport's on-site education centre. It provides a flexible and inspirational learning environment, aimed at children and young adults, with a picnic area and viewing platform where visitors can watch the airport in full operation. The Aerozone offers access to a range of educational materials and activities focused on three themes : STEM, Careers in aviation and The history of Stansted Airport. Have a look at a few of their lesson plans below (click on each to open as a PDF lesson plan) - do contact us if you need anymore! The aim of project SOAR is to provide primary and secondary schools with an introduction to the exciting world of aviation. The project is suitable for girls and boys in all year groups from Reception to Year 13! 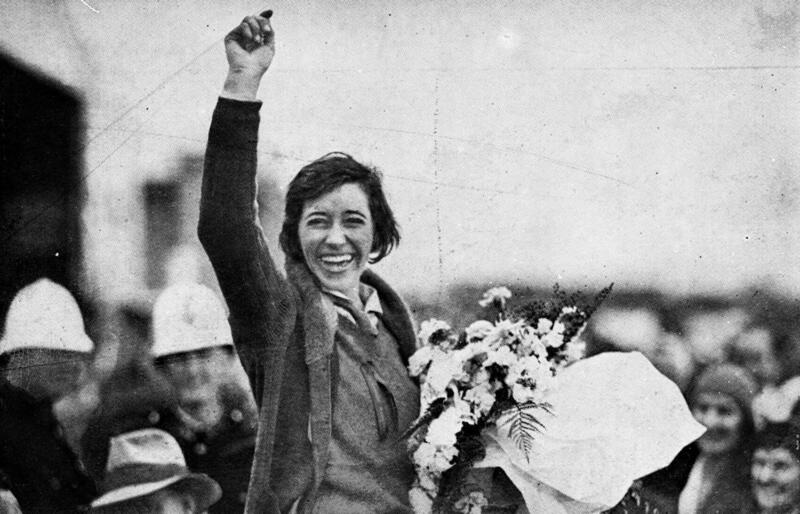 Britain’s most famous aviatrix, Amy Johnson, was the first woman to fly solo from Britain to Australia. She was not only a talented aviatrix but also an engineer and broke many aviation records in her lifetime. 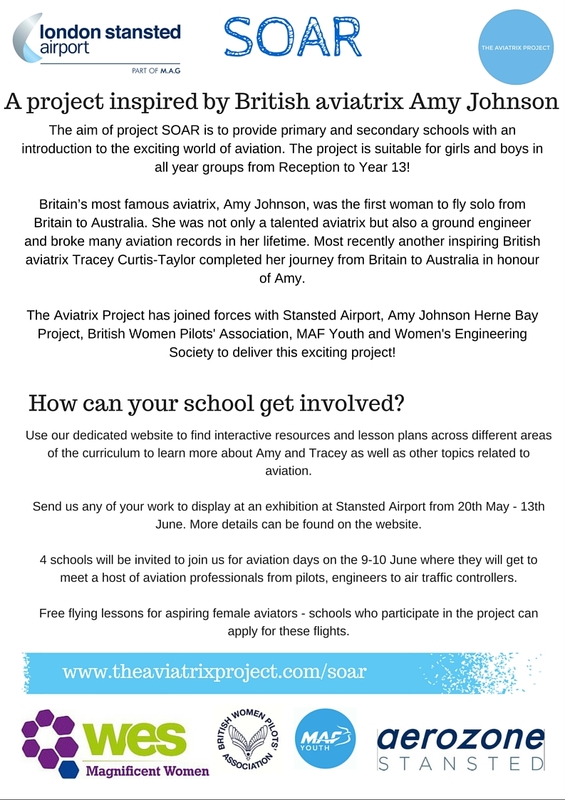 The Aviatrix Project has joined forces with Aerozone Stansted, Amy Johnson Herne Bay Project, British Women Pilots' Association, Women's Engineering Scoeity - Magnificent Women and MAF Youth to deliver this exciting project! Sign up for the project! Sign up with your email address to receive news and updates. Or let us know if you'd like a visit from a pilot or an engineer! How can your school get involved? It's as easy as 1,2,3! Use the links via this page to find interactive resources and lesson plans across different areas of the curriculum to learn more about Amy and Tracey as well as other topics related to aviation. Send us any of your work to display at an exhibition at Stansted Airport Arrivals from 20th May - 13th June. This can be artwork, writing, poetry, photographs of lessons and planes you have designed and flown! Plan a trip to Stansted Aerozone and keep an eye out for free flights and a scholarship which we will be advertising soon! Why not call us if you'd like a visit from a pilot or an engineer to your school! Searching - the search for the wreckage of her plane and answers to the many questions surrounding the untimely death of this pioneer of flight. 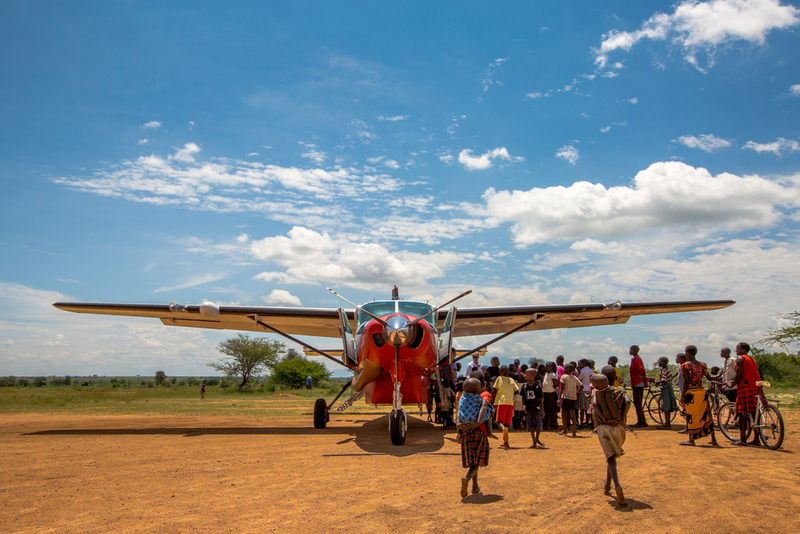 MAF is a dynamic Christian aviation charity, operating 130 light aircraft in around 25 developing countries. Soaring over deserts, jungles and mountains, bringing help to the most isolated communities on earth. At MAF Youth they are passionate about young people and their desire is to educate, challenge and inspire through aviation, mission and adventure. British adventurer Tracey Curtis-Taylor has completed a 13,000-mile flight from the UK to Australia in a vintage biplane, honouring the same journey made by pioneering aviator Amy Johnson in 1930. The 53-year-old piloted a 1942 open-cockpit aircraft over 23 countries, making over 50 refuelling stops on her epic journey. Read more about her journey by clicking on the image above (Images from www.birdinabiplane.com).